Hailie Moody comes into home on a back end slide against the Carbon Hill Lady Bulldogs. 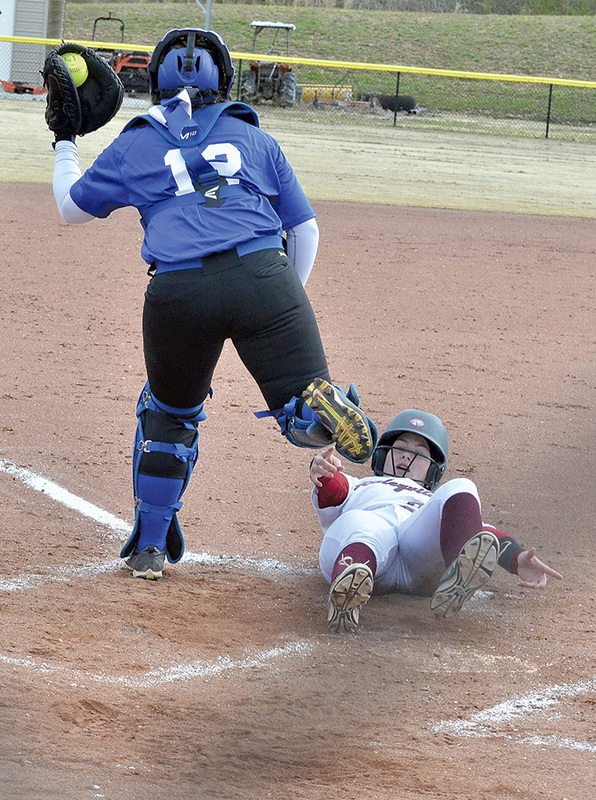 HALEYVILLE - The Haleyville Lady Lions tied two, won two and lost one in the Haleyville softball tournament played at the Haleyville Sports Complex Saturday, March 16. The Lady Lions tied with Carbon Hill in the first game, 3-3. Haleyville tied the game on a home run in the third inning. Ana Aaron started in the pitcher’s circle, going four innings. She had three strikeouts. Lady Lions hit one home run on the day. Hailie Moody went deep in the third inning. Carlie Brazell, Lauran Wilcoxson, Gracie Long and Moody each collected one hit to lead Lady Lions. HHS faced Marion County in the second game, tying 4-4. The Lady Lions knotted the game up at four in the bottom of the fourth inning, when an error scored one run for Lady Lions. Kaylee Riddle tripled in the bottom of the fourth, where Wilcoxson hit a single to right field to score Riddle and tie the game. Aaron, Moody, Riddle and Mallory Rushing each collected hits to lead Lady Lions. Molly Gilbert was in the pitching circle. She had four strikeouts, with 10 first pitch strikes. Anna Lacy Sartin was in the pitcher’s circle for the third game against Huntsville. The Lady Lions won 6-5. Sartin went four innings and had two strikeouts. Carlie Brazell tripled in the bottom of the first inning and scored when Rushing hit a triple to tie the score at 1-1. Rushing then gave the Lady Lions the lead on a fly out by Aaron. The Lady Panthers had a five run inning in the top of the second, but the Lady Lions retook the lead in the bottom of the third. Riddle was hit by a pitch to open the bottom of the inning. Wilcoxson then came up to bat, where Riddle put herself in scoring position on a steal to second. Wilcoxson hit a single that scored Riddle. Sartin singled to center, moving Wilcoxson up a base. Taelor Hyde doubled to put Wilcoxson across home plate and make the score 5-4. Carlie Pendley hit a double to left field to score Sartin and Hyde to take the lead and win at 6-5. Haleyville faced 7A Grissom in the fourth game of the tournament, winning 5-1. Aaron was in the pitcher’s circle for HHS. A walk by Rushing in the opening inning resulted in a score for HHS. Moody singled to advance Rushing to second, Aaron and Gracie Long both walked to load the bases. Sartin’s single to center scored Moody and Aaron to give the Lady Lions a 3-0 lead. The Lady Tigers only score of the game came in the bottom of the first. The Lady Lions put the final two runs on the board in the top of the second. Moody and Brazell crossed home plate to give the Lady Lions a 5-1 lead. Haleyville lost to Muscle Shoals 8-1 in the fifth and final game of the tournament. Gilbert took the loss for HHS.